For centuries incense has been said to bring GOOD LUCK and improve conditions for those who burn it. allGOODLUCK.com is pleased to offer direct to you specially blessed “POWER of FAITH” INCENSE. Burning INCENSE is has been respected as a timeless spiritual practice. It goes back to days of anointment, sacred offerings, weddings, special requests, and open fires where burnt offerings were made. Burning incense is regarded as a healing, soothing and uplifting activity. Each “POWER of FAITH” INCENSE will have a different cleansing, healing and purifying effect. In many religions like Buddhist, Hindu and Christian, burning incense is a way to make offerings of gratitude through scent. Buddhists and Hindus believe that burning INCENSE is a way to purify karma and for the welfare and pleasure of all beings. 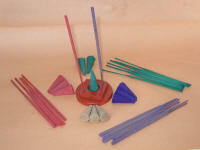 Incense is used for purification and well-being of others. Christians and Jewish traditions have similar beliefs. Tibetan Buddhists perform Chod, burning INCENSE as an offering in the same manner. INCENSE is powerful and brings a positive state of mind. “POWER of FAITH” INCENSE can refresh your heart and mind. Each scent has a deep subconscious impact. It can bring GOOD LUCK and feelings. An allGOODLUCK.com spiritual expert has blessed all of the “POWER of FAITH” INCENSE. The specially blessed “POWER of FAITH” INCENSE kit represents GOOD LUCK, MONEY, LOVE, POWER, and PROTECTION. Click on the photo to enlarge the item. Use for healing, soothing, and uplifting activity. allgoodluck.com makes no claims to the supernatural or of the authenticity of items sold on this site. Products are offered for sale for what they may be worth to the purchaser. No refunds or exchanges. All statements must be taken as legendary or superstition, and should not be taken as any representation of allgoodluck.com, its employees, or its principals.